Cuba is gradually restructuring its external debt which for decades had been largely in default. Over the last three years Cuba restructured official debts with Japan, Russia, China and Mexico. On December 12, 2015 Cuba reached an important accord with 14 of the 20 creditor countries of the Paris Club regarding some $11.1 billion of official debt outstanding, whereby the creditors agreed to forgive past due interest and penalties. Cuba recognizes the original principal and agrees on an 18-year repayment schedule for principal after conversion of a sizable part into local development funds. The agreement will be implemented on a creditor by creditor basis through national development assistance agencies. Cuba’s external debt is not precisely known. The part that is publicly known through creditor and Cuban government sources is the visible debt. Default on outstanding bonds and loans from commercial banks and other private creditors in 1960-1980 give rise to capitalized interest obligations which together with the original principal are not reported in official statistics. Cuba did not acknowledge Russia’s claim of some $32 billion of Soviet era debt until it was mostly forgiven and restructured in 2014. Likewise it did not acknowledge obligations to members of the Paris Club until June 2015 when it recognized a debt of about $15 billion. Debts to commercial suppliers are another blind spot. Those were in substantial arrears during 2009-2011 following the global financial crisis. Oficina Nacional de Estadística e Información (ONEI) reports a reduction in supplier credits of $2.1 billion during 2012. This presumably involved repayment of principal arrears with no indication of treatment of past due interest and penalties. The extent of settlements with suppliers is not known with reports indicating that many smaller suppliers did not receive payments. While the settlements apply to commercial operations with European and Western Hemisphere firms, even less is known of the payment status which Chinese companies which now account for a large share of Cuban imports. Indeed the debt outstanding to official and private creditors in China, Vietnam, Venezuela and a handful of other Latin American countries is not publicly known. The table below shows the visible external debt of Cuba or the debt that is reported by creditors plus the suppliers debt published by ONEI. On this reckoning the external debt of Cuba reached $24.7 billion at the end of 2014 or 31% of GDP. 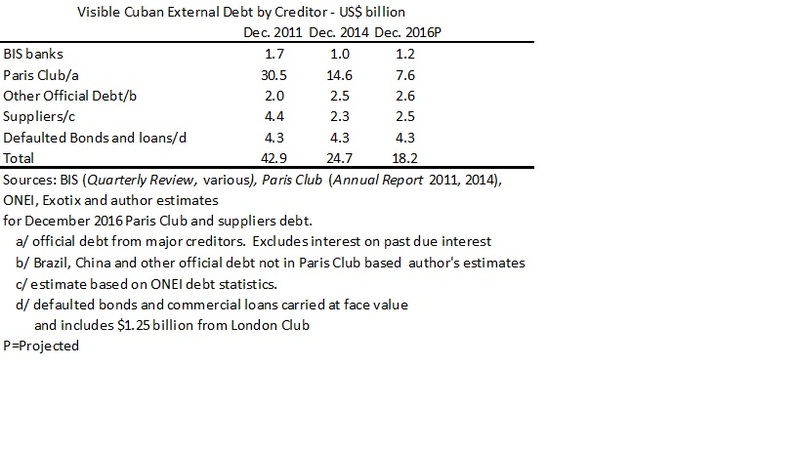 The proposed restructuring with 14 countries under the aegis of the Paris Club will take place during 2016 and will reduce official debt by some $7 billion. After the agreements are implemented, Cuba’s visible external debt will be around $18 billion or about 22% of GDP. Cuba’s visible external debt by end 2016 will have been more than halved in five years by means of restructuring with Russia, Mexico and members of the Paris Club. While the 2016 projected ratio of debt to GDP is moderate at 18% of GDP, Cuba’s weak international liquidity poses difficulties in debt servicing. For example, the new agreement with the Paris Club considerably lowers the external debt but means that Cuba will start to pay interest and principal on its obligations. We estimate this may be about $400 million per year in contrast with essentially zero payments made in past years. This is a significant sum given weak export performance and the apparent stagnation in international reserves. Lacking information on contractual agreements governing external debt, it is not possible to calculate reasonable estimates of overall debt service. The long history of debt arrears speaks for itself regarding the precarious nature of the island’s debt servicing capabilities. Recent debt restructuring begins to open the door for new official credits and loan guarantees from development and export credit agencies of developed countries. It is early to tell whether or not this will be substantial. Much will hinge on Cuba’s opening the economy to foreign investment that will in turn depend on efforts to ease operating conditions for foreign firms in the island. The Cuban government surely reckons that future lending and aid from developed nations will compensate for the newly negotiated debt service payments. Cuba is following an unorthodox path to restructuring its Paris Club debt. It is able to restructure without the usual previous agreement with the IMF. This shows pragmatism on the part of creditors and negotiating ability on the part of Cuba. It is time, however, for Cuba to broaden its horizons and begin consideration of renewing its membership in the main international financial organizations. Claire Guelaud, Accords “historique” sur la dette cubaine et “innovant” a Grenade, Le Monde Economie, December 15, 2015. Creditor countries in the new agreement are: Australia, Austria, Belgium, Canada, Denmark, Finland, France, Italy Japan, the Netherlands, Spain, Sweden, Switzerland and the United Kingdom. Luis, thanks for this analysis. It would be interesting to see how much of local development projects get off the ground.